Bolgheri is the ultimate wine tours destination for Super Tuscan wine lovers. This is where the Tuscan wine revolution began in the late 1960s and early ’70s with winery pioneers like Sassicaia leading the way towards a more open-minded and ultra high-quality approach to winemaking in the region. Today the Bolgheri wine appellation (Bolgheri DOC which encompasses wineries in both the village of Bolgheri as well as the adjacent wine hamlet of Castagneto Carducci) is synonymous with fine wine. Virtually all of the cellars here are exceptional and making award-winning collectible wines. Big names, of course, include Sassicaia, Ornellaia and Angelo Gaja´s Ca` Marcanda, and smaller cult wine cellars include Michele Satta, Le Macchiole, Grattamacco, and Poggio al Tesoro. The area is beautiful with medieval hamlets and lush countryside, lined with cypress trees and olive groves. The weather is also fabulous due to its proximity to the coast in Southern Tuscany. We have designed this special day excursion in the Bolgheri wine country for guests arriving at Livorno by cruise or staying in Pisa, as it is an easy one hour drive from each. You will enjoy VIP winery visits and vineyard tours at two boutique estates, followed by an outstanding Michelin starred lunch at the mythical Gambero Rosso on the seaside. Lunch will be a relaxing affair with various courses paired with fine Bolgheri wines. If you are looking for a luxurious food and wine day out in the Bolgheri wine country, then contact us for more information on this tour! This morning your elegant driver and luxurious Mercedes will collect you at your cruise or hotel and will sweep you away to the wine roads of the “Etruscan Coast”. Drive south for one hour to the medieval village of Bolgheri, crowned with a fairy tale castle. 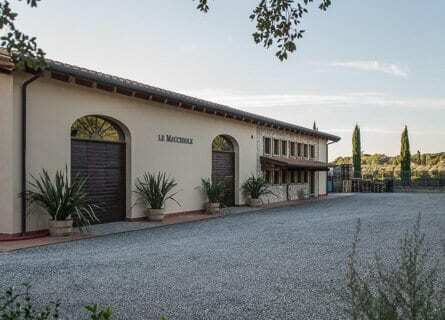 Your first VIP winery visit today is at Le Macchiole, a prestigious and very pretty estate. Enjoy a private tour of the property and follow with a tasting of flagship wines such as the Cabernet Franc-based Paleo, Bolgheri and the single-vineyard Syrah Scrio. Le Macchiole’s is indeed considered to be one of the best wines in the entire Bolgheri region. Carry on to your next wine tour of the day, at Grattamacco. This lovely organic estate rests atop a peaceful hill with views of the Thyrrenian Sea. Taste three of their best wines and learn all about their winemaking philosophy and about the grape blends they employ (Cabernet Sauvignon, Merlot, Sangiovese, Cabernet Franc and Petit Verdot for the reds and Vermentino for the white). Grattamacco also makes a range of olive oils using the premium Frantoio, Moraiolo, Leccino, and Pendolino olives, and you will receive a gift bottle to take back with you. After a full morning of wine tasting and stomping in the vines, you will travel a few miles down the road to San Vincenzo. A gourmet feast awaits! Owner-chef Fulvio Pierangelini is one of the world’s top chefs and often referred to as Italy’s best chef. You will indulge in his tasting menu at the Gambero Rosso restaurant, holder of two Michelin stars. The menu is focused on seafood and Mediterranean ingredients, prepared with innovative pizzazz. Various wines from the Maremma will be paired with the numerous dishes. Buon appetito! Finally, concluding an extraordinary day of wine tasting and high-end gourmet dining, your driver will transfer you back to Livorno or Pisa and drop you back to your cruise or hotel. We hope you enjoyed this unforgettable wine tour of Bolgheri in Northern Maremma! Both Ornellaia and Petra were superb. Lunch at Ombrone was wonderful. The setting, hospitality, and ambiance were perfect. Fantastic food and very warm welcoming hosts. It was maybe the most enjoyable meal we had during our time in Italy. My grandmother was Sicilian and every day at work she would make lunch for my grandfather, father, uncles myself and my cousins (do you think our business was a family business?). She retired at 92 and lunch has never been the same. Anyway the food at Ombrone reminded me of her cooking and I can pay no higher compliment. Our driver was Davide and a better choice could not have been made. He was very friendly, courteous, patient and informative. Absolutely would recommend Cellar Tours again, everything was done right.